The question that constantly perplexes every individual at one point or another is - What is the point of our very humble existence? However Thirteen year old Anna Fitzgerald, the protagonist of Jodi Picoult’s brilliant novel which is a heart-warming story has never had to even question this thought as she already knows the answer since birth. In her book Picoult creates a touching story of a family faced with the predictable loss of one of their own. My Sister’s Keeper is an endearing and passionate story about the Fitzgerald family who is ready to do anything for the love of their family and yet they are not able to change circumstances. Picoult takes us to another level of love and sacrifice within a family with this novel. With characters such as Sara Fitzgerald who is the mother of Anna, we see how a mother can be so focused yet confused about the future of her children. When writing from the perspective of Anna’s mother, Picoult discusses the meaning of motherhood. The story revolves around Anna, brought into the world to keep her leukemia-stricken sister Kate alive. Over the years Anna does everything she can to save her sisters life, she undergoes all treatments and tests and donations that the doctor’s advice in order to keep her dying sister alive. But when Kate’s organs begin to fail, and the Fitzgerald’s expect their youngest daughter to get them out of this by donating her kidney, the strong willed Anna lashes back at her parents who conceived her out of desperation and not desire, by suing them for the medical rights to her own body. Anna knows that if she denies her sister the kidney, Kate will die but she says, "Lately I have been having nightmares, where I'm cut into so many pieces that there isn't enough of me to be put back together." On the other hand she also feels what kind of a person would kill her own sister, she starts questioning her own strong and final decision. It hits her when she thinks that her decision is going to kill the person who defined her from day one. Towards the end when Kate is almost nearing her death Anna says, "I didn't come to see Kate because it would make me feel better, I came because without her, it's hard to remember who I am." The very fact the story is in present tense and each chapter is the perspective of each member of the family is what makes it all the more interesting and touching where you just can’t put the book down before you have reached the end. The different events and the different perspective of each character from Anna, her parent’s, her brother’s, her lawyers is what lends an appropriate breathlessness to the narrative. However, it is the surprising end that changes everything. 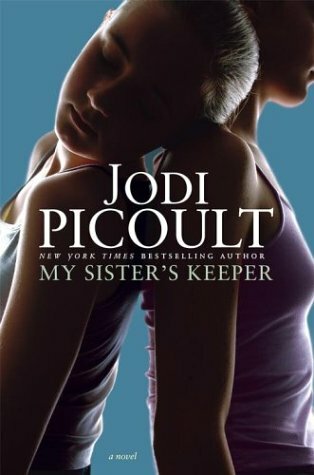 My Sisters Keeper takes you on journey of love, hope and sacrifice, and it reminds you of how one twist in life can change your life and the life’s of people involved in your life. Nothing can change what has already been decided for you. Picoult takes this very sensitive issue of illness, and the decision of parents of having another child just to keep their other kid alive, and handles it with a lot of grace and compassion.